I know little about antiques however I have several I don't know what period of time they are from,what they might be worth, and I don't know how to go about selling them. I am attaching a picture of the dressers and chairs. If you can give me any guidance on the questions set forth above I sure would appreciate it. I somehow associate this with Fort Vancouver, OR. circa 1850. IIRC Fort Vancouver Chief Factor's Residence is furnished with mostly French antiques. 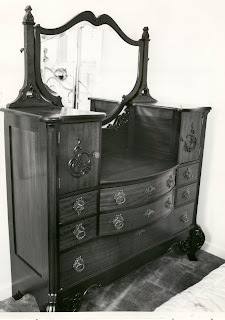 but there is a something that connects in my mind - actually with both the dresser and the chairs.